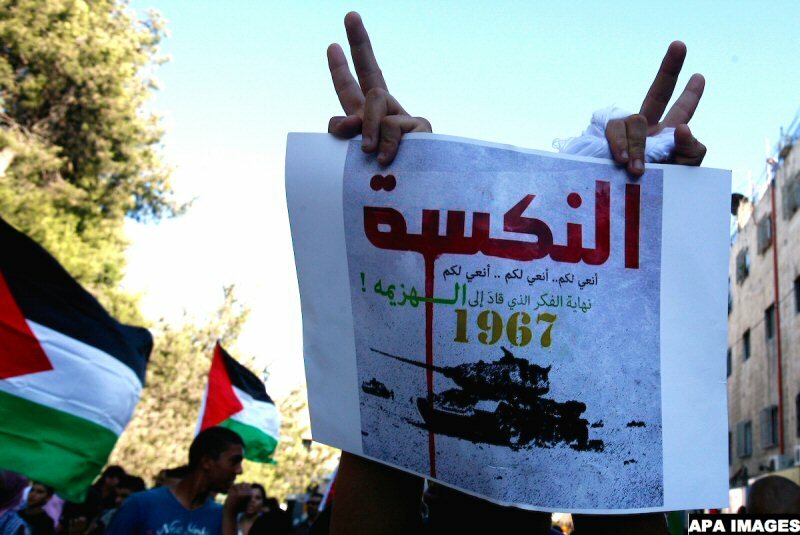 Palestinians marked, on Tuesday, June 5th, the 51st anniversary of the “Naksa,” or “setback,” when Israel invaded and occupied the West Bank, Gaza, Sinai, and the Golan Heights in 1967, during the Six-Day War, displacing some 300,000 Palestinians, as well as thousands of Syrians, from their homes. Palestinian officials and local rights groups have called upon people in all areas affected by the occupation and illegal Israeli settlements, to organize sit-ins and protests in commemoration of the day. Officials and rights groups called upon the international community to not only take action but demand every country to assume its legal responsibilities and stop all cooperation with the Israeli occupation, and to secure freedom and independence for the Palestinian people and protect them from the ongoing crimes and violations committed by Israel. Furthermore, according to Ma’an News Agency, officials declared the coming Friday to be a “Day of Rage,” encouraging people to protest and, for those who are able to, travel to occupied East Jerusalem and establish a presence at the Al-Aqsa Mosque. According to Israeli media, Israeli forces raised the level of alert on the Israeli border, along the eastern Gaza Strip, in anticipation of events of the anniversary of the Naksa.